Imagine: You stand at a party, shrouded in the mystery of anonymity. Gone are the pink and blue totems of the binary past. As you dance and drink, exchange furtive glances with the others swirling around you, you catch glimpses of your own multitudes reflected back at you. 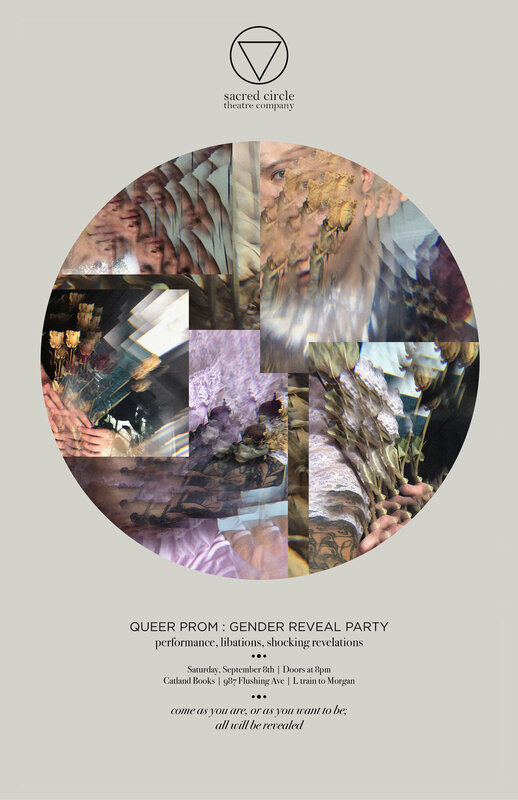 Join Sacred Circle deep in the kaleidoscope of gender for a wild and delectable Queer Prom! It’s a Gender Reveal Party. A cake is being baked. Phantom figures appear in a pantheon standing guard over the sweet treat. Each spirit carries with it an ingredient for the recipe. When the cake is cut, the mystery of gender will finally be revealed. Featuring decadent performances by Mia Longenecker, Becca Travis, Anise, Chelsey Rausch, Elina Shnayderman, Raymond Arnold, and assorted mystery guests! Come dressed in your most gender-revealing OR gender-defying best! Dance the night away as you expose the far reaches of your identities!